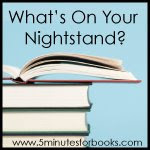 It's the 4th tuesday of the month and 5 Minutes for books is hosting "What's on your Nightstand. 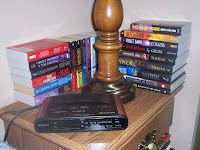 Here's the actual picture of my nightstand. 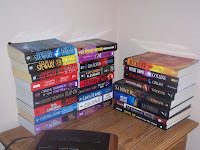 And a picture so you can see what the actual books are. Browse down to the Fall Reading Challenge to find out about these books. I've covered most of them there. I can only read one book at a time. If I try to read more than one, it gets confusing. I read in the morning before Father gets up. I read in the afternoon after lessons and housework and laundry is done. I read in the evening after James goes to bed and before Father gets home from work. Or when Father is watching forensics or cop shows on TV. He finds them interesting and relaxing. I find them yucky and depressing. It's funny. When I was pregnant with James, a co-worker at my old job told me "You'll never find time to read again when the baby comes." How wrong she was - I will always find time to read. If it means less tv or less time on the internet, then its worth it. I crack myself up that when I see books I just have to get a close-up look at them, whether I'm in someone's house and peeking at their bookshelf, in a bookstore, or at the library, overwhelmed by the sight of books everywhere. It was no different when I saw your photo - I had to click on it and see it bigger! lol I haven't read any of them, except maybe one of the Brandilyn Collins books. I want to read Sinner! I can AlWAYS find time to read! Loved the Kanner Lake Series, daughter is reading it now. I'm the same way -- if I'm making time to read, it means less of something else, but that's okay.